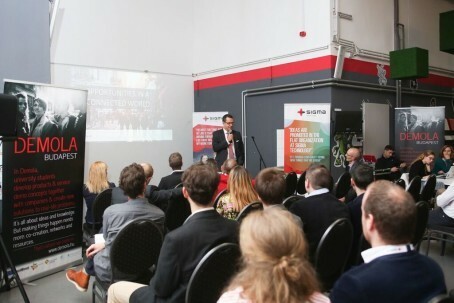 On November 19th Demola Center in Budapest lightened up as Sigma’s Internet of Things conference, co-organized by Sigma Technology and Sigma Software, unfolded. The choice of topic for the conference was definitely not by random: experts agree that IoT is the “next big thing” that will significantly change the way we live, work, travel, or even dress. According to a recent McKinsey report, the potential economic impact of IoT applications could reach up to $11.1 trillion per year in 2025. The event opened with a welcoming note from H. E. Mr. Niclas Trouvé, Ambassador of Sweden to Hungary, and was followed by keynote speeches. Fredrik Hedlund, CEO at Sigma Connectivity, talked about opportunities in a connected world, emphasizing how “useful conversations” between sensors and smart devices will transform everything from our homes and offices to roads and public places. Yevgeniy Yakovlev, Head of Odessa Office at Sigma Software, presented his thoughts on the future of connectivity, citing real-world examples from ongoing development projects; finally, Clint Heyer, associate professor at Malmö University, gave an insight on how the human factor affects the Internet of Things. Between the keynote speeches guests were engaged in lively team discussions, and enjoyed excellent food and wine. The conference ended with a team competition and closing words from Carl Vikingsson, CEO at Sigma Technology. The photo report from the conference is available on Facebook.